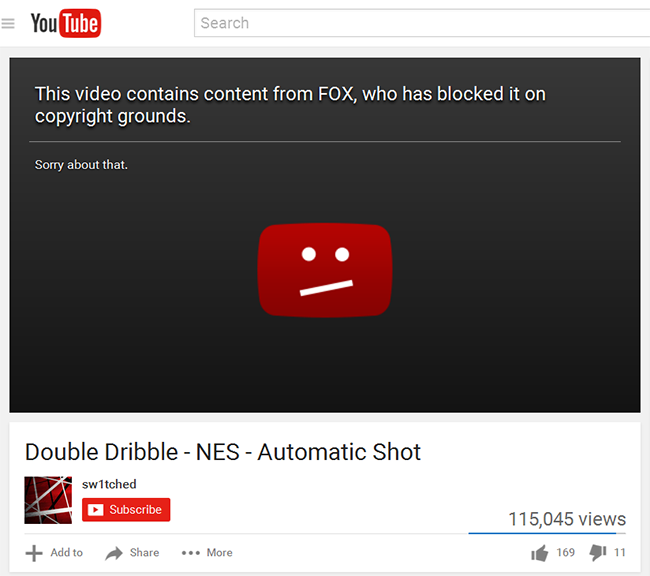 This entry was posted in Anime, Computer, Game, Murmuring, Network, Recreation, Television, WWW and tagged claim, copyright, dmca, false, family, fox, guy, takedown, youtube on May 21, 2016 by Gea-Suan Lin. The GitHub API will now respond with a 451 status code for resources it has been asked to take down due to a DMCA notice. This entry was posted in Computer, Murmuring, Network, Political, Social, WWW and tagged 451, code, dmca, github, http, ietf, legal, notice, paper, rfc, status, takedown on March 19, 2016 by Gea-Suan Lin. The UMG-YouTube agreement grants UMG rights to effect the removal of user-posted videos through YouTube’s Content Management System (“CMS”), based on a number of contractually specified criteria that are not limited to the infringements of copyrights owned or controlled by UMG. Klaus Decl., Ex. 4 (Klaus to Kavanaugh letter, Dec. 14, 2011). Dotcom speculates in his declaration that Universal must have sent a so-called “DMCA notification form,” such as the one he printed and attached at Ex. E to his declaration, to YouTube. Doctcom Decl. ¶ 11. But UMG (which interacts with YouTube) does not use that form when requesting the removal of material pursuant to UMG’s contract with YouTube. UMG uses YouTube’s automated CMS system. This entry was posted in Computer, Movie, Murmuring, Network, Recreation, Television, WWW and tagged copyright, dmca, google, group, music, umg, universal, youtube on December 17, 2011 by Gea-Suan Lin. This entry was posted in Computer, Murmuring, Network and tagged dmca, github, legal, takedown on February 4, 2011 by Gea-Suan Lin.